Byron and I don't really have a traditional way of celebrating Valentine's Day because this is only our second. During our first, we were swamped with wedding planning, and I don't even remember how we celebrated. The only part of it I remember is my gift to him--a round bottom flask with confetti hearts and pink tissue paper and a "love potion." This year, I knew I wanted to do a little something to celebrate...including food. My favorite restaurant in town, Cafe Homestead, hosts monthly farm to table meals. Their Saturday seating for February filled up before I could reserve us seats. With several other people in the same boat, they opened up their restaurant for Valentine's Day--perfection! The menu had our mouths watering the whole week! It was obviously what I was looking forward to...but Byron made the day even sweeter by waking me up with a "Happy Valentine's Day!" and holding a small jewelry bag over my head...I wouldn't mind that wake up more often! After my eyes adjusted, I rolled over and pulled out the most adorable pendant necklace! WHAT A SWEETHEART! 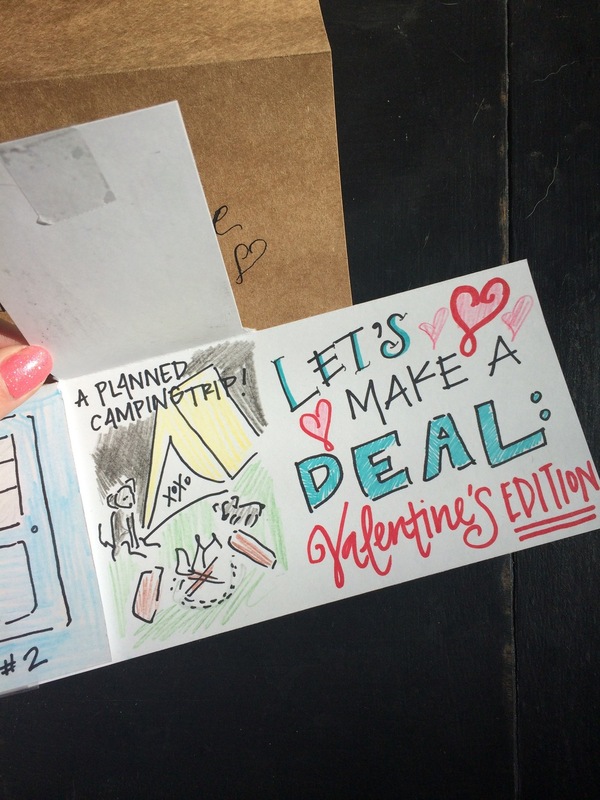 I got up and began getting ready for the morning and snuck my love letter and "Let's Make a Deal: Valentine's Edition card" onto his bedside shelf. He heard my rustle and read the card and then amused me by playing the game as I did my best Wayne Brady. Byron traded door 2 for door 3 and stuck with it, winning a planned camping trip from yours truly...actual plan to come later. We both took off, sending lovey-dovey messages and selfies throughout the day. After giving away Sochi the pup to my sister, we dolled ourselves up and headed off to grab a drink before dinner. Dinner did not disappoint! Having memorized the menu, I was delightfully surprised when a special soup course came out--loaded potato soup--my favorite! (I scarfed it down so fast, there is no picture proof it ever existed.) Everything else was as expected, and absolutely appetizing. We left completely stuffed and crashed with full hearts and bellies as soon as we got home! What did you do for Valentine's day? !